Providing cash flow solutions to businesses in Denver Colorado, Wyoming and Salt Lake City, Utah. Riviera Finance is an invoice factoring company providing the following services for companies in Denver, Salt Lake City, and across Colorado, Wyoming and Utah. Established in 2005, this company needed to maximize cash flow to handle seasonal increases in load volume and a surge in new contracts. 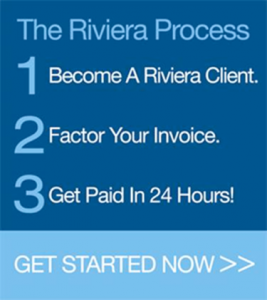 Riviera Finance quickly established a full-service factoring line which provides free credit checks and converts invoices to cash within 24 hours. The client is funded twice a week on a non-recourse basis. As a value-add, Riviera Finance prepares and mails checks to the client’s carriers. Between April and June, 2013, this client doubled its factored volume and continues to experience healthy growth. Fifteen years ago this business owner moved to the U.S. with dreams of owning his own company. After four years he made his dream a reality and created a business that provided services to oilfields. Recently, he was awarded a sizable contract that presented cash flow challenges. Riviera was able to move quickly to approve his customer’s credit and factor his invoices, providing him with working capital to keep his operations going. This husband and wife team had been in the oilfield service business for two years. As the resurgence of the industry continued, they were faced with both opportunities and challenges. They were referred to Riviera in order to help seize these new opportunities. Riviera was able to work with them and their customers to achieve a solution that would help them reach their short and long-term growth objectives.